The moon Rhea is the outermost of Saturn's five large inner moons, with a diameter of 948 miles. 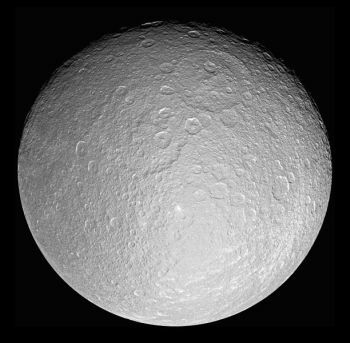 It is the second largest of the planet's moons and ninth largest in the solar system. It lies 327,530 miles out from its host planet, which it orbits in 4.52 days. Initial calculations of the density of the moon Rhea indicated that it's made of three-quarters water ice, with the rest being rock. 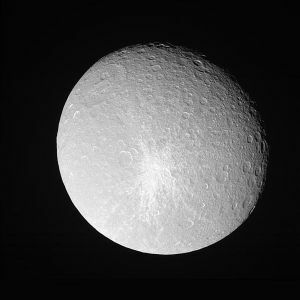 Subsequent observations have suggested that Rhea has a homogeneous interior, meaning that there is no rocky core at all, but just water ice throughout. This matter has not, to date, been satisfactorily resolved. This moon's surface features are very similar to its neighbour Dione, with quite heavy cratering. These craters fall into two distinct areas: near the poles and the equator, where they are typically less than 25 miles across and everywhere else, where they are greater than 25 miles in size. 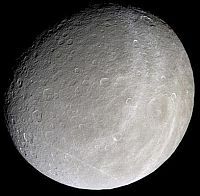 The moon Rhea also features two huge impact basins of 250 and 310 miles diameter. The larger, Tirawa, can be clearly seen in the top image on this page. Just like the moon Dione, Rhea has the "Wispy Terrain" feature on its trailing hemisphere. Similarly, this terrain covers a good part of this hemisphere. As with Dione, these light coloured regions are actually enormous ice cliffs formed by fracturing of the surface. A very tenuous atmosphere was detected on Rhea by NASA in 2010. It consists of five parts oxygen to two parts carbon dioxide. The presence of oxygen is easily explained by the magnetosphere of Saturn acting on the surface water ice. The carbon dioxide is, however, more difficult to account for. Various non-visual observations of Rhea have suggested that there may be a modest ring system around the moon. 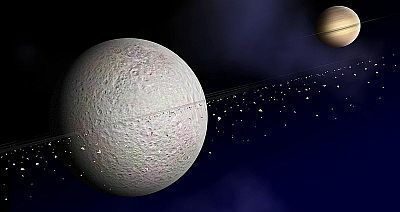 Consisting potentially of three bands within a disk, if it existed, it would make Rhea the first moon to be discovered with its own ring system. Unfortunately, all flybys carried out by the Cassini probe subjecting the moon to visual observation could find no evidence of rings. The subject is still, therefore, very contentious.